New Horizons just woke up from its long nap, and now it’s just a few months away from reaching Pluto. 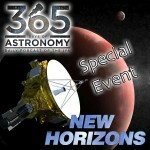 Join New Horizons’ Primary Investigator +Alan Stern, as well as other members of the science team to discuss the status of the mission so far and the next big events that will happen with New Horizons. This will be your chance to hear directly from the New Horizons team, and we’ll be glad to take any mission-related questions you might have.